The company doesn't know if its major deal will actually happen. At a time when many traditional retailers have struggled, discount chains have done well. That may be why investors punished Fred's Inc. (NASDAQ:FRED) after the company released disappointing February sales numbers. Fred's, which owns and operates 643 discount general merchandise stores and three specialty pharmacy-only locations in the southeastern United States, reported on March 3 that overall sales for February dropped 3.5%, while comparable-store sales fell by 4%, after gaining 0.8% in the same month in the prior year. In addition to having a rough sales month, Fred's is still in limbo when it comes to possibly buying 865 stores from Walgreens Boots Alliance, Inc. (NASDAQ: WBA) and Rite Aid Corporation (NYSE: RAD) for $950 million in cash. That deal would more than double the size of the company, which essentially makes any past sales trends irrelevant. Those two pieces of news were enough to send the company's share price steadily downward throughout March. 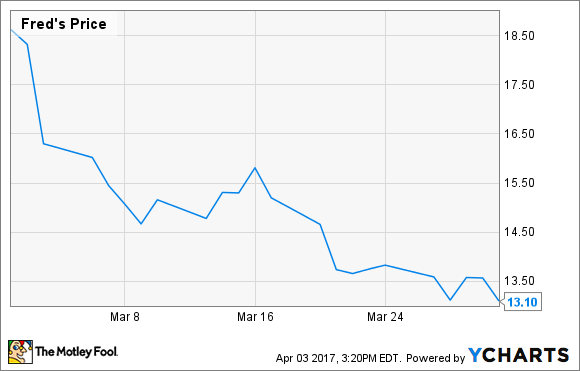 After opening the month at $17.98, shares ended March at $13.10, a 27% drop, according to data provided by S&P Global Market Intelligence. Fred's would have a much larger traditional pharmacy business if its deal with Walgreens goes through. Image source: Getty Images. CEO Michael K. Bloom blamed the down month on consumers getting their tax refunds later than they traditionally do. He also made it clear in his remarks in the company's press release on its February sales that he does not expect the negative trend to continue. Despite the tax refund delay impacting a significant percentage of our customer base and our front of store sales, we are pleased with the progress we are making against our strategic plan, demonstrated by our continued improvement in retail and specialty pharmacy. This is an affirmation that our healthcare strategy is working. Notably, comparable store sales in our overall pharmacy business were strong in the month, driven by positive adjusted prescription comparisons. What's next for Fred's depends on if federal regulators decide to allow the Walgreens purchase of Rite Aid to proceed. It's possible that as a condition of that deal happening, Walgreens will have to sell off even more locations, and Fred's could be the beneficiary of that. Going forward, it's hard to judge the company's prospects until you know what the chain will look like, but bad sales numbers could be a simple case of bad timing. That, of course, would suggest a big bounce-back in April, when it reports its March sales numbers.